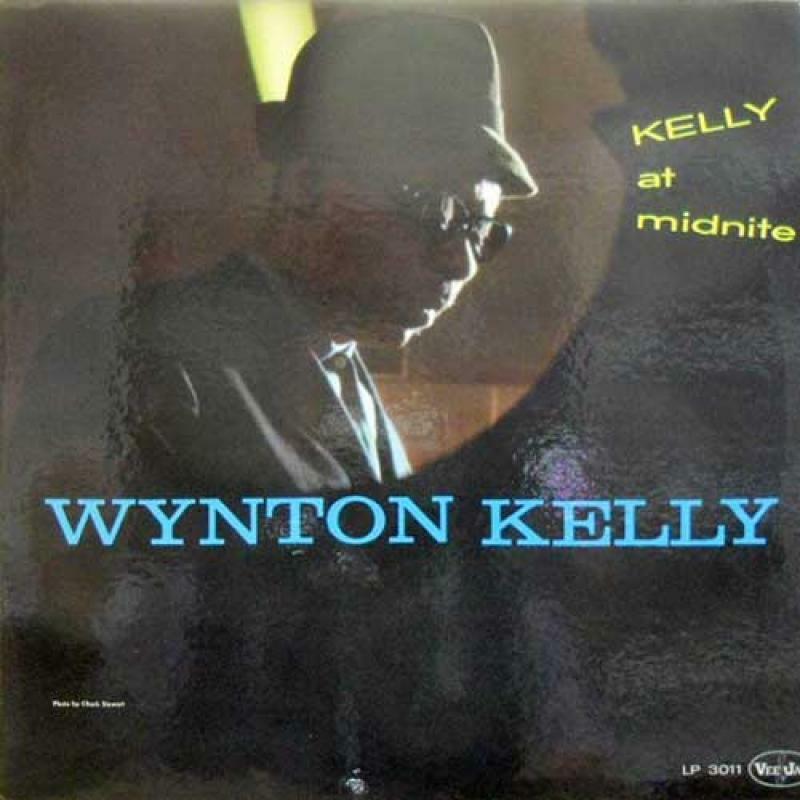 When thinking about Wynton Kelly, midnight is not the first allusion that comes to mind. The pianist’s style, however bluesy, predominantly brings about images of sunshine, broad daylight, wafts of salty sea air traveling through the seams of your Hawaiian shirt… But of course, the supple blue noted set of Kelly At Midnite justifies the title. Besides, it’s a perfect hang-up for a great sleeve. Jamaica, Marley territory, land of hot breeze, rowdy clubs, shady hoodlums, ganja and tax shelter and probably much more than the stereotypes that yours truly the Flophouse Floor Manager conjures up, birthplace also of Dizzy Reece and Monty Alexander, is where Kelly was born in 1931, yet his family moved to Brooklyn, New York after a few years, which found the talented youngster in the capital of jazz. A look at the career path of Kelly takes your breath away: two extended stints in the Dizzy Gillespie band. Accompanist of Dinah Washington and Billie Holiday. Part of the Miles Davis group from 1959 to ’63. An amazing discography as a sideman that includes: Johnny Griffin’s A Blowin’ Session, Sonny Rollins’ Newk’s Time, Dizzy Gillespie’s Birks’ Works, Cannonball Adderley’s Cannonball Adderley Quintet in Chicago, Blue Mitchell’s Big Six, Clark Terry’s Serenade To A Bus Seat, Miles Davis’ Kind Of Blue (on Freddie Freeloader) and Friday Night At The Blackhawk I & II, John Coltrane’s Giant Steps, James Clay & David “Fathead” Newman’s The Sound Of The Wide Open Spaces, Hank Mobley’s Soul Station and Workout, Wes Montgomery’s Full House, Cecil Payne’s Zodiac. And so on. During his tenures with Miles Davis and Wes Montgomery in the sixties, Kelly recorded as a leader for VeeJay and Riverside, mostly with the guys he knew (inside out) from those groups, Jimmy Cobb and Paul Chambers. Kelly never hit big as a leading artist. But history has been kind, as Kelly, who perhaps grew more out of Teddy Wilson and Erroll Garner than Art Tatum and Earl Hines, is seen as a very influential player. Being influential, alas, hardly pays for a mortgage, at least not in those dark jazz ages. By 1967, ultimate sideman Kelly’s career was effectively over. Paradoxically, that year’s album Full View on Milestone is one of his best albums. Kelly passed away in 1971 following an epileptic seizure. Here, the drum chair is held by Philly Joe Jones. Jones, who before Kelly At Midnite was featured on Kelly’s Riverside album Piano in 1958, supplies the pianist with a trademark dose of fireworks, heat and taste. His drive is matched by Paul Chambers, the young bass master, who also contributes high-level solo’s throughout. On Stage is especially enticing, the uptempo mover crackles, sizzles, boils, with Kelly’s leaping, crisp lines the icing on the cake. A typical hard bop set of blues-based, largely medium-tempo tunes and a sole ballad, Kelly At Midnite is a collection of deceptively simple snappy tales from one of those pianists that has been copied frequently but seldom matched.